Laminate is one of those materials that requires a bit more attention. I like to buff sand with 220-grit sandpaper, wipe off the sanding dust with a dry terry towel, and use an oil-base primer. The adhesion you gain with the primer will ensure that your top-coat adheres. I can't believe you would seriously recommend a chip brush for anything other than spreading glue or making color swatches. They are terrible! Granted, Glidden exhibits very good flow out ability, however, it sheds bristles and the courseness of those bristles encourage bubbles in the paint. Even the cheapest of the "All Paint" synthetic bristle brushes would out perform them, albeit, at more cost. I personally use foam rollers and Purdy oxhair brushes to affect a glass like finish. Granted, Home Depot, nor most paint stores, don't carry them because of their cost. During my contracting days, I would have sprayed those cabinets. Further, a chip brush might act as a squeegee to push paint along an horizontal surface, but how about the verticle surfaces of the base cabinets? That same flow out rheology that evens so well on a flat surface is going to want to sag and run on the verticle! Hardly the paint to be used by an amateur using a $1.50 brush! One further comment on Glidden and all oil/alkyd based enamels: the whites show yellowing badly. It is one of the few advantages of acrylics over the oils on fine cabinets or woodwork. Like almost every DIY project, there are numerous ways to get the same result. The Home Depot sells most of their product in a "Good, Better, Best" ... offering alternatives for almost every project. I repeatedly recommend the inexpensive chip brush for oil-based products. And my customers repeatedly come back and thank me for helping them produce outstanding results. It is no secret ... oil-based paints self-level over their six-hour dry time. This eliminates virtually all of the brush strokes regardless of the quality of brush used. Eric brought photos of his rebuilt mantel and used the chip brush combined with the Glidden Porch and Floor high-gloss oil. He reported (and showed) professional results using these tools, and he is just one among dozens who have come back to The Paint Pit to proudly share their success. I might add that Eric reported his wife was "extremely happy" with the results ... possibly a DIYer's truest acid test! I wouldn't begin to argue with success and these inexpensive brushes have a long track record of success! 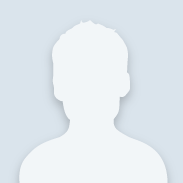 I'll continue to recommend this tool because it works ... over and over again! Hmmm, I guess the pros have been foolishly wasting money on those quality Purdy's, Liebco's, Grumbachers, etc. :) Or, could it be, that contractors demand more of their own work and paying customers have higher expectations? i will be refinishing my cabinets again yes for the second time science the first time did not turn out so well. Is this gladden paint still available ? Glidden is absolutely still making their oil-based high gloss paint! Glidden is changing some of their labels, so you might not see this exact can. Simply ask your Paint Associate and they will help you locate and mix any color you choose. Follow the detailed instruction earlier in this thread and you should have great looking cabinets in no time. I'm building a toy box for my niece and was planning on using the paint you recommend above, but all I found was Glidden Porch and Patio, and it states that it is 100% latex. Will that be as durable as the polyurethane oil gloss? We plan on doing some stenciling over the base white gloss. What paint would be acceptable to use as a stencil paint (black) and then a poly to cover the whole toy box (and seal the stenciled letters)? I'm concerned about yellowing of the poly. What a great project ... building a toy box for your niece! Glidden Porch and Floor has recently been re-labeled and it looks a bit different now. The old green label has been replaced with a blue label. Unless you are in a region that does not sell oil products, you should be able to get the Oil Polyurethane product for your project. Ask your Paint Associate for assistance ... the product you seek should be on the shelf near the Glidden Porch and Floor. And, the answer to your question is "no" ... the latex version of this product is not as durable and will not protect your toy box nearly as well. NOTE: The original post was about cabinets, but you might also consider Rust-Oleum oil-based as an alternative for your toy box. 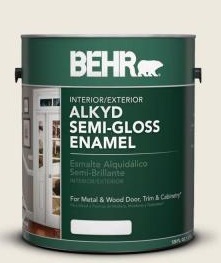 Since this post started three years ago, Behr has introduced its water based alkyd enamel. It has been a great seller in California, where the State has all but outright banned oil paint. Other areas of the country now have it, but it is still not available at all Home Depot stores. IT IS AVAILABLE ONLINE. WB Alkyd enjoys the attributes of oil alkyd, but with the benefits of water clean up . It levels beautifully, has low odor, is rated interior/exterior, dries to a HARD, durable finish and exhibits great adhesion. Although it will not act as a primer on bare wood, it will bond directly to old finishes in good condition. It is an ideal product for those wishing to paint out those old generic "honey oak" cabinets of the last coljple decades. It requires the same preparation as all good paints: clean the surface well to remove dirt and grease,and then scuff sand. WB Alkyd has its own color chart, but will tint to most of Behr's color pallette. The 3900 White is slighty grayer out of the can than Ultra Pure White, due to the inherent nature of the alkyd resin. Two coats of 3900 will cover just about anything. WB Alkyd sprays beautifully with airless spray equipment. I have had reports that it is usuable in traditional spray equipment if thinned somewhat. It can be thinned with water, although the label states it should not be thinned. A call to Behr and a talk with one of the chemists that developed it, revealed that the warning was put on the label so as not to confuse painters who might think that being an alkyd, paint thinner would be the right solvent. Having sold it since last April in the Sherwood, Oregon store, the reviews from customers has been overwhelmingly positive! There is a little learning curve to its application. Like all water based paints, the work time is somewhat short. When brushing and rolling, one must work deliberately and quickly. Overbrushing to remove brush marks is a mistake. One must trust that it will level itself out. IT WILL ! Also different from latex paint is the dry time. Although it dries to the touch within an hour or so, the recoat time is 4 to 8 hours. Alkyd dries by internal polymersation. Even when appearing dry, the molecules are internally continuing to link up and exhibiting continued rheology. Priced in the low $30 range, this is an unbelieveable value. My only complaint is that it is only available as a semi-gloss and only available in gallons. Water-based Alkyd Semi-Gloss that has several of the properties of the traditional oil-based products. The label looks very similar to the current oil-based version, so be very careful to look for the words "Soap and Water" under clean-up. 4) Is suitable for trim, cabinetry, plaster, wrought iron, cinder block, aluminum, and stucco. I've said it many times ... Behr is a total quality company, taking the lead by adjusting their offering to provide better products. Gotta love the way they do business!! !